Fond du Lac, Wisc. 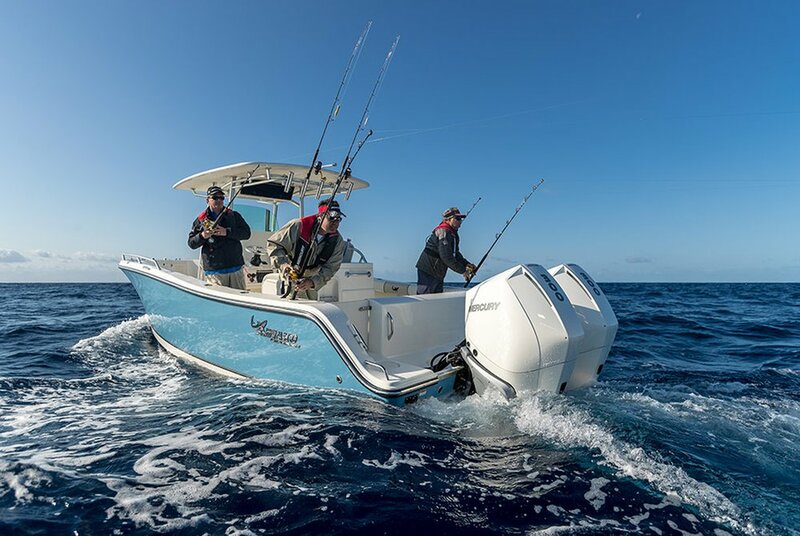 - Mercury Marine recently expanded and augmented its outboard lineup by launching multiple V8 4.6-liter outboard models – the 250 and 300hp Verado®, the 250 and 300hp FourStroke, the 200, 225, 250 and 300hp Pro XS®, and the 225, 250 and 300hp SeaPro – as well as the V6 3.4-liter 175 Pro XS®. In February, Mercury introduced the V6 3.4-liter 175, 200 and 225hp FourStrokes and the V6 3.4-liter 200hp SeaPro at the 2018 Miami International Boat Show. These next-generation outboards constitute the largest new-product development program Mercury has undertaken in its 79-year history, prompting a major expansion to its manufacturing footprint. 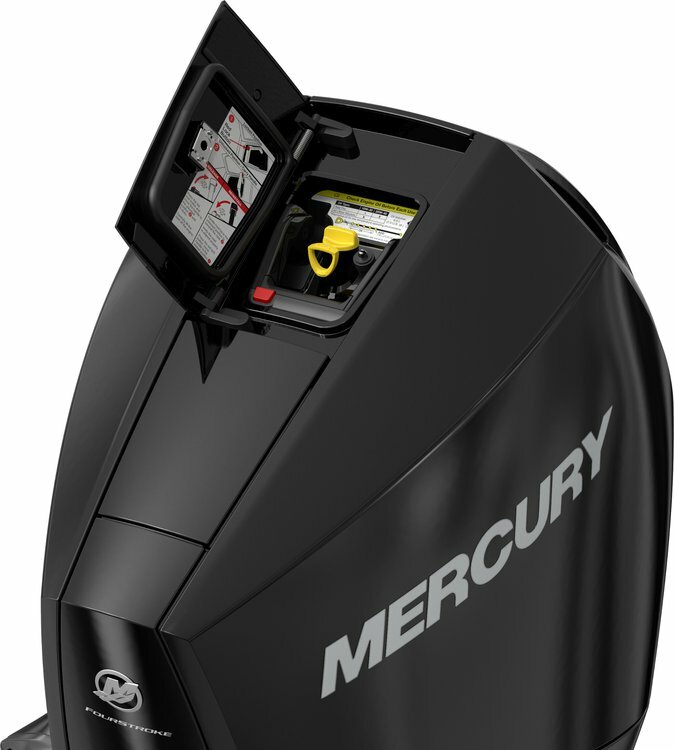 Mercury’s new V8 and V6 outboard engines are highly configurable to meet the needs of a wide variety of boating segments, from Verado’s refined performance; to the FourStroke’s fuel efficiency and rigging versatility; to the competitive edge that Pro XS provides tournament anglers; and to SeaPro’s remarkable commercial durability and reliability. 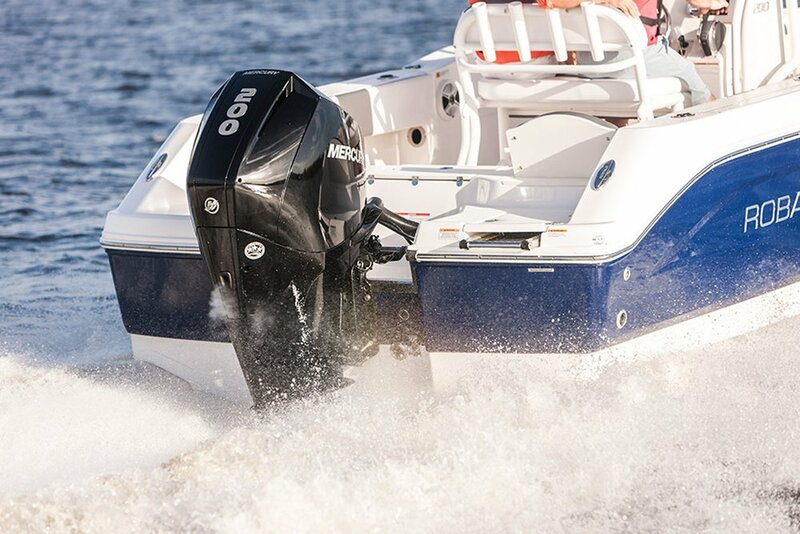 The new 250 and 300hp V8 Verado outboards raise the bar for the marine industry – again. 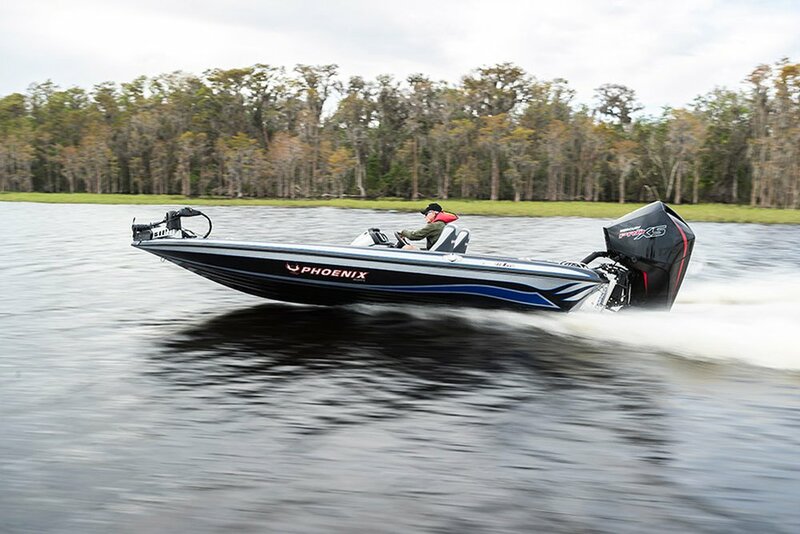 Continuing Verado’s legacy as the most refined outboard on the water, the new V8 platform provides exhilarating performance across the rpm range. Sea trials have shown the 300hp Verado is up to 20 percent quicker and 2 mph faster than the closest competitor, while still providing up to 8 percent better fuel economy. The V8 Verado engines are compatible with Mercury Joystick Piloting for Outboards for maximum maneuverability and control, and feature Mercury-engineered digital controls and electro-hydraulic power steering for smooth operation. Equipped with Adaptive Speed Control, they deliver increased throttle response and a “sportier” feel. The Verado driving experience is further enhanced by class-leading sound-and-vibration reduction for an ultra-smooth and quiet ride. The new engines feature Mercury’s exclusive Advanced MidSection (AMS), which moves engine mounts aft and outward to virtually eliminate vibration from being transmitted to the boat. In fact, transmitted vibration is a whopping 60% less than the leading competitor’s 300hp engine. Models equipped with the AMS also feature electro-hydraulic power steering and are compatible with Mercury’s Joystick Piloting system, which provides maximum control and maneuverability in multi-engine applications. 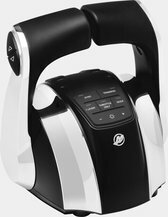 The exclusive Advanced Sound Control feature allows users to toggle between ultra-quiet operation and a “throatier” sport sound. Mercury’s Warm Fusion White, Cold Fusion White and Pearl Fusion White cowl-color options – in addition to traditional Phantom Black – combine with four factory accent color panels and a “paint-ready” panel to let owners further personalize their engines. The new 250 and 300hp V8 FourStroke outboards are high-tech but not high-stress, delivering powerful performance while remaining quiet, efficient, reliable and strong. The high-displacement, quad-cam design of the new V8 powerhead generates plenty of torque, especially at mid-range. The 300hp FourStroke delivers up to 9% more torque than the nearest competitor at 3500-4500 rpm. It boasts class-leading 4.6L displacement yet is the lightest in the 300hp class by more than 10 pounds. Combine ample power with lightest-in-class weight and the result is exhilarating FourStroke performance from a highly reliable engine. These new FourStrokes are also exceptionally versatile, offering consumers choices between mechanical or digital (Digital Throttle & Shift) controls and hydraulic or power steering. That versatility makes them the ideal outboard choice for repowering a wide range of hulls. The new V8 FourStroke engines are also available in multiple colors, and they can be further customized with the addition of an accent panel, as detailed in Verado section (above). The new V6 175hp and the V8 200, 225, 250 and – for the first time ever – 300hp Pro XS engines are the next generation of tournament-winning performance. Featuring Mercury’s new lightweight cowl, these engines deliver everything the serious angler needs to remain competitive, including ample torque from their high-displacement powerheads and superior acceleration from quad-cam design and Transient Spark technology. The V8 250hp Pro XS bested the leading competitor in both acceleration and top end in sea trials – and delivered up to 16 percent better fuel economy at cruise. The next-generation TorqueMaster gearcase is available for select models; and 200-300hp Pro XS models are available with either mechanical or digital controls. The V8 Pro XS performance-tuned exhaust tone is engineered to deliver a brawny sound quality guaranteed to turn heads. Dial in the new Pro XS models with a wide selection of Mercury propellers for ultimate performance. 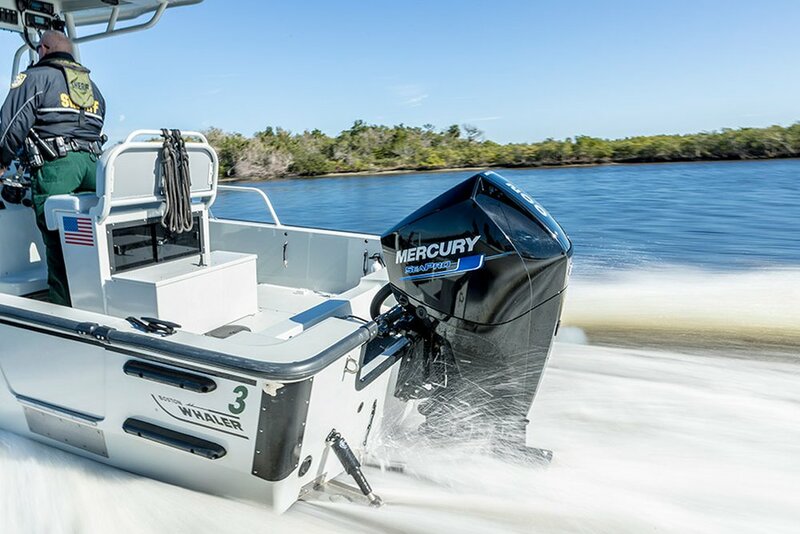 Mercury bolstered its already-powerful family of commercial outboards by launching four new V8 4.6L models in three horsepower classes: the 225, 250 and 300hp SeaPro models and the 300 SeaPro AMS (Advanced MidSection). All offer the durability, reliability and efficiency for which SeaPro is widely known. The new SeaPro engines give Mercury a complete lineup of four-stroke commercial engines from 40hp to 300hp. Mercury’s new 225-300hp SeaPro engines are designed to offer higher displacement at a lighter weight than competitor models; in fact, each of the V8 SeaPro CMS (Conventional MidSection) models is the lightest in its class. Mercury has calibrated the new V8 SeaPro models to produce loads of torque at lower rpm levels, enabling users to work their outboards hard without placing stress on the engine, while their exceptionally compact, lightweight design combines with Advanced Range Optimization (ARO) to maximize fuel economy at cruise. A high-output alternator in the V8 SeaPro CMS models delivers 20 amps net at idle and 85 peak amps, while the V8 300hp SeaPro AMS engine boasts a class-leading 115-amp alternator. The 225-300hp SeaPro models come equipped with a boat-mounted water-separating fuel filter kit, diagnostic SmartCraft gauges, and a graphic owner’s manual supplement. SeaPro’s industry-leading warranty for commercial users Includes protection against corrosion, a significant advantage over competing products. True to SeaPro’s workhorse heritage, the new V8 225-300hp SeaPro models are engineered to deliver years of trouble-free performance. They are manufactured with heavy-duty components to cope with the demands of global commercial operation – including a gearcase that is validated at three times the lifespan of a recreational gearcase. The new V8 300hp SeaPro is also available with AMS, providing an exceptionally smooth ride. AMS models also feature electro-hydraulic power steering and are compatible with Mercury’s Joystick Piloting for Outboards system. Select V8 and V6 CMS (Conventional MidSection) outboards are compatible with mechanical or digital controls, hydraulic or power steering, and the Mercury Big Tiller. 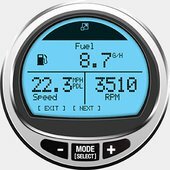 Adaptive Speed Control: Maintains a desired rpm regardless of changes in load or conditions without adjustments to the throttle lever position – a first for the outboard industry. Exceptionally smooth and quiet: Tuned multi-chamber air intake minimizes airborne noise; fuel injector covers reduce high-frequency noise. 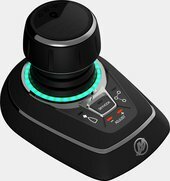 Industry-exclusive battery-management technology: When battery voltage decreases, the engine will automatically increase idle rpm to boost alternator output and recharge low batteries to the proper level, protecting operators from draining their battery while trolling. The exclusive Top Cowl Service Door simplifies routine maintenance – you can check the oil level or add oil without removing the top cowl.